WHO: America’s premium saké company, SakéOne, will hold its annual kura blessing Saturday, September 28th, 2013. WHAT: This symbolic, community ceremony with ancient Shinto roots is designed to cleanse the brewery for the year to come. Admission to the spiritual kura blessing is free and will be open to the public. The event has always served to raise awareness of Japanese culture and tradition in the local community. 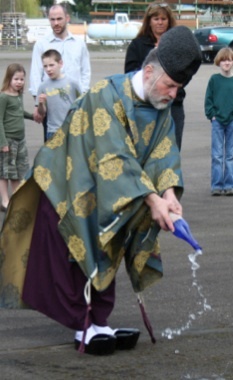 The Shinto ceremony will be presided over by the Reverend Koichi Barrish of the Tsubaki Grand Shrine of Granite Falls, Washington, who uses a specialty brew for the occasion. Afterwards, guests can enjoy saké, Wassabi’s Japanese-fusion cuisine and an exhilarating taiko performance by Portland Taiko, an Asian-American drumming ensemble. Following the blessing, there will be a unique tasting at the kura in honor of International Saké Day, which is on October 1st. A flight of three award-winning Daiginjo sakés will be available for purchase ($10 per person). WHEN: The ceremony will be held from 10am-12pm, and the saké tasting will begin at 12pm and end at 4pm on Saturday, September 28, 2013. For more information, please contact 503-357-7056 x235 or email tastingroom@sakeone.com or click here. VISUALS: To view a video of a kura blessing, where Reverend Koichi Barrish drizzles saké and tosses flower petals to cleanse the brewery, please click here. MORE: SakéOne was founded in 1992 as a joint partnership with Momokawa Brewing Japan originally as an importer, later to be the original American operated Kura (brewery). SakéOne is the leading producer of “Ginjo” (premium) grade sake in the United States and today produces premium sakés under the Momokawa and G labels as well as innovative new products, such as the fruit-flavor infused saké under the Moonstone brand, in addition to its imported brands. Most recently, SakéOne released SakéMoto, a smooth and slightly dry saké with rice from the Yamaguchi prefecture, Kasumi Tsuru, a Kimoto style saké, as well as their newest American produced genshu saké, g fifty. SakéOne distributes its saké in all 50 states, Canada, Mexico, South America and the Caribbean. A leader committed to saké education at the wholesale, retail and consumer levels, SakéOne is focused on expanding the enjoyment of premium saké in the United States. For more information, visit SakéOne’s website at sakeone.com.